10 And Joshua turned back at that time and captured Hazor and struck its king with the sword, for Hazor formerly was the head of all those kingdoms. 11 And they struck with the sword all who were in it, devoting them to destruction; there was none left that breathed. And he burned Hazor with fire. 12 And all the cities of those kings, and all their kings, Joshua captured, and struck them with the edge of the sword, devoting them to destruction, just as Moses the servant of the Lord had commanded. 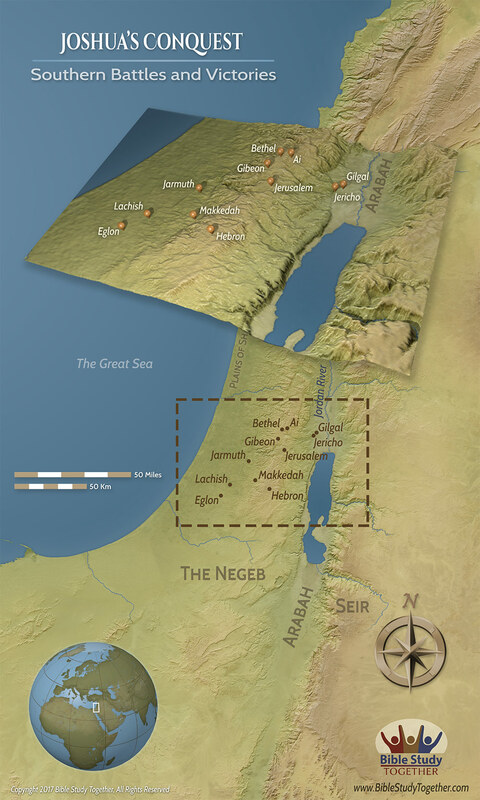 13 But none of the cities that stood on mounds did Israel burn, except Hazor alone; that Joshua burned. 14 And all the spoil of these cities and the livestock, the people of Israel took for their plunder. But every man they struck with the edge of the sword until they had destroyed them, and they did not leave any who breathed. 15 Just as the Lord had commanded Moses his servant, so Moses commanded Joshua, and so Joshua did. He left nothing undone of all that the Lord had commanded Moses. 10:28And that day Joshua took Makkedah, and smote it with the edge of the sword, and the king thereof he utterly destroyed, them, and all the souls that were therein; he let none remain: and he did to the king of Makkedah as he did unto the king of Jericho. 10:29Then Joshua passed from Makkedah, and all Israel with him, unto Libnah, and fought against Libnah: 10:30And the LORD delivered it also, and the king thereof, into the hand of Israel; and he smote it with the edge of the sword, and all the souls that were therein; he let none remain in it; but did unto the king thereof as he did unto the king of Jericho. 10:31And Joshua passed from Libnah, and all Israel with him, unto Lachish, and encamped against it, and fought against it: 10:32And the LORD delivered Lachish into the hand of Israel, which took it on the second day, and smote it with the edge of the sword, and all the souls that were therein, according to all that he had done to Libnah. 10:33Then Horam king of Gezer came up to help Lachish; and Joshua smote him and his people, until he had left him none remaining. 10:34And from Lachish Joshua passed unto Eglon, and all Israel with him; and they encamped against it, and fought against it: 10:35And they took it on that day, and smote it with the edge of the sword, and all the souls that were therein he utterly destroyed that day, according to all that he had done to Lachish. 10:36And Joshua went up from Eglon, and all Israel with him, unto Hebron; and they fought against it: 10:37And they took it, and smote it with the edge of the sword, and the king thereof, and all the cities thereof, and all the souls that were therein; he left none remaining, according to all that he had done to Eglon; but destroyed it utterly, and all the souls that were therein. 10:38And Joshua returned, and all Israel with him, to Debir; and fought against it: 10:39And he took it, and the king thereof, and all the cities thereof; and they smote them with the edge of the sword, and utterly destroyed all the souls that were therein; he left none remaining: as he had done to Hebron, so he did to Debir, and to the king thereof; as he had done also to Libnah, and to her king. 10:40So Joshua smote all the country of the hills, and of the south, and of the vale, and of the springs, and all their kings: he left none remaining, but utterly destroyed all that breathed, as the LORD God of Israel commanded. 10:41And Joshua smote them from Kadeshbarnea even unto Gaza, and all the country of Goshen, even unto Gibeon. 10:42And all these kings and their land did Joshua take at one time, because the LORD God of Israel fought for Israel. 10:43And Joshua returned, and all Israel with him, unto the camp to Gilgal. 11:1And it came to pass, when Jabin king of Hazor had heard those things, that he sent to Jobab king of Madon, and to the king of Shimron, and to the king of Achshaph,11:2And to the kings that were on the north of the mountains, and of the plains south of Chinneroth, and in the valley, and in the borders of Dor on the west,11:3And to the Canaanite on the east and on the west, and to the Amorite, and the Hittite, and the Perizzite, and the Jebusite in the mountains, and to the Hivite under Hermon in the land of Mizpeh.11:4And they went out, they and all their hosts with them, much people, even as the sand that is upon the sea shore in multitude, with horses and chariots very many.11:5And when all these kings were met together, they came and pitched together at the waters of Merom, to fight against Israel.11:6And the LORD said unto Joshua, Be not afraid because of them: for to morrow about this time will I deliver them up all slain before Israel: thou shalt hock their horses, and burn their chariots with fire.11:7So Joshua came, and all the people of war with him, against them by the waters of Merom suddenly; and they fell upon them.11:8And the LORD delivered them into the hand of Israel, who smote them, and chased them unto great Zidon, and unto Misrephothmaim, and unto the valley of Mizpeh eastward; and they smote them, until they left them none remaining.11:9And Joshua did unto them as the LORD bade him: he hocked their horses, and burnt their chariots with fire.11:10And Joshua at that time turned back, and took Hazor, and smote the king thereof with the sword: for Hazor beforetime was the head of all those kingdoms.11:11And they smote all the souls that were therein with the edge of the sword, utterly destroying them: there was not any left to breathe: and he burnt Hazor with fire.11:12And all the cities of those kings, and all the kings of them, did Joshua take, and smote them with the edge of the sword, and he utterly destroyed them, as Moses the servant of the LORD commanded.11:13But as for the cities that stood still in their strength, Israel burned none of them, save Hazor only; that did Joshua burn.11:14And all the spoil of these cities, and the cattle, the children of Israel took for a prey unto themselves; but every man they smote with the edge of the sword, until they had destroyed them, neither left they any to breathe.11:15As the LORD commanded Moses his servant, so did Moses command Joshua, and so did Joshua; he left nothing undone of all that the LORD commanded Moses.11:16So Joshua took all that land, the hills, and all the south country, and all the land of Goshen, and the valley, and the plain, and the mountain of Israel, and the valley of the same;11:17Even from the mount Halak, that goeth up to Seir, even unto Baalgad in the valley of Lebanon under mount Hermon: and all their kings he took, and smote them, and slew them.11:18Joshua made war a long time with all those kings.11:19There was not a city that made peace with the children of Israel, save the Hivites the inhabitants of Gibeon: all other they took in battle.11:20For it was of the LORD to harden their hearts, that they should come against Israel in battle, that he might destroy them utterly, and that they might have no favour, but that he might destroy them, as the LORD commanded Moses.11:21And at that time came Joshua, and cut off the Anakims from the mountains, from Hebron, from Debir, from Anab, and from all the mountains of Judah, and from all the mountains of Israel: Joshua destroyed them utterly with their cities.11:22There was none of the Anakims left in the land of the children of Israel: only in Gaza, in Gath, and in Ashdod, there remained.11:23So Joshua took the whole land, according to all that the LORD said unto Moses; and Joshua gave it for an inheritance unto Israel according to their divisions by their tribes. And the land rested from war. How was Joshua faithful to obey all that Moses commanded him? What are some examples of how the Israelites were strong and courageous? Why didn’t the inhabitants of the land make peace with Israel? Is there any area of your life that should be devoted to destruction? If yes, how can you follow Israel’s example to destroy it. Team up with other believers to drive out pride and selfishness from each of your own hearts.